“From Soup to Nuts, Science Has it Covered” – Me. This is science we’re talking about – not pseudo-science. True science is paid for by tax dollars, and reviewed by a group of people who have everything to lose if their research is challenged. That makes it dependable, stable, and resilient. Pseudo-science, on the other hand, is not funded by tax-payers, and anyone in the world with a theory or idea can present it! This is hardly the same thing as the stately peer-review process that benefits real science by stabilizing it and keeping the untrained upstarts in line. Now that we understand the ground rules for science, we can proceed in a search for truth. So, here is the truth as we know it from rigorous scientific investigation. First, there was nothing, which exploded. Or, perhaps “expanded,” and then expanded again later, and may also contract someday, or keep expanding and get cold. We call this the “big bang.” We know this is true because some starlight seems more red than other starlight. There is also radiation in space, leftover from the initial ‘bang.’ Voila. The Big Bang is a proven theory. Yes, some people take exception with the idea of “everything from nothing,” but they are just playing word games. The ‘big bang’ was a quantum flux, and not a “creation ex-nihilo.” Its origins are still being investigated. Let’s move on. After the universe was created in the ‘big bang,’ galaxies and stars and planets had to form. They did this according to a model first proposed by the kindly old philosopher, Immanuel Kant. Professor Kant taught at the university in his hometown of Königsberg, capital of East Prussia, in 1700s Bavaria. Influenced by Isaac Newton’s revolutionary concept of an invisible force called “gravity,” the good professor wondered if galaxies and all bodies within them could form from the accumulation of dust and matter in empty space. Good news, he was right! Mike Zolensky, NASA Johnson Space Center: If you look under your bed, you find that little bits of dust are collecting together into large dust balls. And something like that must be what happened in the solar system, too. If they collide slowly, they can add up to a larger object and gradually grow. Neil deGrasse Tyson, Astrophysicist/NASA Spokesman: With enough collisions, dust grew into pebbles and pebbles grew into rocks. And as the rocks grew larger, so did the collisions. Zolensky: If they collide head on or at higher velocities then they’ll actually break apart, like shooting a gun at a wall. Tyson: But other times, the rocks stuck together. And the larger they got, the stronger their gravity became. Zolensky: Gradually, they grow from golf ball size to rugby ball size and then house size and then township size. And then one or two of these objects would get large faster than anything else and become the big boys on the block. Tyson: Eventually, some of these planetesimals grew as big as our moon. And then they combined to form the four small, rocky planets closest to the sun: Mercury, Venus, Mars and Earth. These small moons continued to accumulate via the above-described process, until they were large hulking planets. It’s a surprisingly simple process. They were then made to spin and separate, so they did not just become one giant dust-bunny-rock in space. If they had endlessly accumulated, we would not be here, so that did not happen, clearly. These were then pulled into ‘orbit’ or rotation around some very large dust bunny accumulations that became very big iron balls that then became nuclear furnaces, due to the same process (we call these “stars”). And we say, “Thank you, gravity!” A weak molecular force, that can do wonders when asked. There are some researchers who claim that these are not satisfactory models, that the ‘big bang’ is just a nonsensical recapitulation of the Genesis myth – “first there was nothing, then there was all creation” — and that the ‘dust ball’ story is ludicrous beyond belief or repair. Some of these critics contend that space is in fact a coursing sea of electromagnetic currents, whose shape and energetic patterns are clearly visible, and reproducible in experiment. They argue that electromagnetic force is trillions (and trillions and trillions and trillions) times stronger than gravity, and is the only force capable of rendering matter into stars and planets. They believe that these currents are known to form the spiral shape of galaxies, whose currents feed stars, which then expel rocky planets, under electrical disequilibrium and stress. These ‘electric universe’ proponents also argue that comets, meteorites and other large rock fragments in space, exhibit electrical sparking phenomena when they enter a solar system, and equalize electrical charge by releasing huge quantities of power when entering planetary atmospheres, such as when comets have impacted Jupiter, or Earth, causing brilliant flashes of light and energy prior to impact. They also state that these charged bodies tend to repel each other violently in space, and do not ‘clump together.’ They have even posted a list of predictions about such events. These critics also believe such pseudo-scientific notions as large planets and comets enacting close fly-bys of Earth in ancient times, which caused wild electrical flaring, in the form of filamentary plasma tails and lightning release. Some of these “electric universe theorists” believe that these events are recorded by archaic cultures as violent sky gods or monsters. Near impact events? Rogue planets in the sky? It is safe to conclude that these people are practicing pseudo-science and dismiss anything they have to say, as it’s tainted with nonsense. Also, and perhaps most importantly, their research is not tax-funded, which is the surest way to tell if someone is a true scientist, serving the public good, or a ‘pseudo-scientist,’ out for his own glory. And so, with no major objections, we can sum up and move on. Again, “nothing” exploded, and then the dust bunnies collected, became rocks, etc. And boom, we’re here. Now that we’ve understood science’s explanations for the origins of the universe and galaxy, we can move onto planets with confidence, knowing we’re standing on firm ground. Plate Tectonics – A theory explaining the structure of the earth’s crust and many associated phenomena as resulting from the interaction of rigid lithospheric plates that move slowly over the underlying mantle. Subduction – The sideways and downward movement of the edge of a plate of the earth’s crust into the mantle beneath another plate. As young Earth came into being, it began to cool. It had been made hot from all of the dust accumulation. It was hottest in the center, and the heat was lost through its outer layers. So how did it become the Earth we know today? The most common analogy used by scientists for the development of Earth is the following: A pot of boiling water. Why boiling water? Because the boiling young Earth was “convecting” material from the inside to the outside, just like a pot of water. In the above image, you can see the convection zones, looping from the core to the mantle, and back from the mantle to the core. Witness the long loops of heat transfer, from the bottom, to the top – just as in a liquid, except in densely packed rock. This is what makes subduction possible on Earth, but on no other planet. When you boil liquid, nature organizes and subdivides the heated material into well-ordered zones and patterns. This is oil being heated in a pan. It forms small, discrete hexagons. The hot material rises through the middle, and the cool material (cool, because it’s being cooled by the air above it), courses down the sides. Nature – always ordering and organizing. Now, for comparison, this is a picture of the Earth’s surface, with the oceans taken away to see the whole thing. Ah, that’s better. Now you can see them. Sure, they don’t really look anything like the convective cells that form in liquid. But the Earth is made of rock, of course, not liquid, so there are bound to be differences. As you can now see, the Earth is covered, like an armadillo, or a knight-errant, in hard thick plates. These consist of the continents that we live on, and the ocean floors ,too. These plates rest and float on the upper surface of the planet, and appear to sail around, smashing into each other – but slowly, very, very slowly. Crash and sail. Sail and smash. – Above: Time-lapse reconstruction of sailing tectonic plates over 600 million years, credit National Geographic video documentary. “If you’re confused, join the club; even the Earth seems confused,” explains the narrator. But it remains a fact. Let’s continue…. Let’s go back to those convection cells in the boiling water. Their role is essential. The plates are pulled along by the convecting currents they form. Plates “ride” on top of the convecting cells, and then dive under other plates, so that the Earth remains the same size. The Earth is ruptured all around its surface by long volcanic ridges, known as “spreading zones,” or “divergent boundaries.” These circle the globe and surround the continents, stretching 70,000 kilometers in length. They’re a splitting seam in the Earth, out of which heat and lava push and flow. New material is added to the ocean floor here at the ridges. The ocean floor is pushed up, but it then slides away from the split, like a broad-shouldered footballer, or a heavy shopping cart loaded with groceries drifting out-of-control in the parking lot, shoving the rest of the ocean floor, which is made of rock, away from the seam. Thousands of miles away, where the other side of that same slab of ocean floor meets a continent, that little shove causes the ocean floor to slide over, and then down beneath another piece of ocean floor (but slowly! ), and go back into the center of the Earth. That’s subduction. And remember, if subduction didn’t occur, there would be no plate tectonics, which occurs on Earth, and nowhere else. 1. Subduction is what happens when the ocean floor dives under another piece of ocean floor. 2. Or, when the ocean floor dives underneath a continent. 3. Continents can never dive beneath ocean crust, except once in a while, but usually not. 4. And if they do, the diving ocean crust and ocean floor just change places, so that the ocean floor is diving and not the continent. – 2008, The Teaching Company, Lecture 19, “Subduction Zones: Recycling Oceans,” from the series “How the Earth Works.” Professor Michael E. Wysession, Washington University in St. Louis; Ph.D., Northwestern University. Let’s review: If one subducting plate touches another, which contains some continental material, they will simply trade places, and the one that was being subducted will now do the subducting. But how do entire shelves of ocean floor just “flip-flop?” It’s a little complex, to be sure, but it is part of subduction, which does occur and is a fact. It is, perhaps, cutting-edge information, which is a little hard to understand the first time. After all, it is being taught by an accredited, professional university-level geology teacher, and it is what university students and future geologists are now memorizing, so you can bet on it’s veracity. Let’s return to convection cells for a moment. Here is a slightly exaggerated model of how the young Earth might have looked because of all the heavy convection that was forming it. Note you can still see the convective cells on the surface, and still make out their shapes where they cooled, before the oceans filled the planet. The exaggeration is only slight, and is only done in order to demonstrate the convection patterns of Earth. The real Earth has also been affected by extraneous forces, such as impact with rogue meteors and planet-sized asteroids, which have probably significantly altered its original form. – Artist’s impression of the convective young Earth after the dust-ball collection but before the oceans arrived. The convection cells stand out clearly. But a question remains: How did the oceans arrive? Scientists are still puzzling that out. Some contend that rogue asteroids made of ice battered the Earth and made the oceans. This is the leading hypothesis at present. Now we’ll have to face a little hard truth. Not all models are entirely accurate projections of reality; sometimes they’re simplified a bit to aid the learning process. In that sense, boiling water may not be the best model for Earth, because Earth is made of rock, minerals and metals. Scientists have therefore devised a more complex and accurate model than boiling water. They favor hot soup, pea soup, or oatmeal. As he says, with just a little imagination, you can see that when water cools and descends, it is a subduction zone, just like that which causes solid rock to descend through solid rock on Earth’s surface. Of course, the Earth is probably still a little more complex even than soup, because while soup and porridge are mostly liquid, the Earth is solid, made of hard, packed, dense, hot and cold rock and ore mixtures, that reach straight down for hundreds and hundreds of miles. Maybe all the way to the core. No one really knows, because no one’s been there. We are familiar with images of molten rock (magma). There are areas of liquid magma intrusion in the mantle – pockets and channels of molten lava, some forming lakes and reservoirs that build up to great pressure over time. Most of the flowing magma occurs in the splitting zones, at the ocean ridges, and in a smaller but significant percentage in island and continental volcanoes. But magma is not what the mantle is made of. The mantle is highly pressurized solid rock, far denser than anything that is on the surface. To paraphrase: Ice, which melts above thirty-two degrees Fahrenheit, flows and melts when it forms glaciers. And so rock, under pressure, will not only distort and bend to a limited degree, but will act just like ice, so that other rocks can float on it and appear to sail through it, over great lengths of time. That is a lot of of pressure; more than I’ve ever seen in my soup bowl. So, really, truly, the Earth is probably not like miso soup. One other issue is that miso soup doesn’t expel a solid rock and metal crust when it cools, which would more or less stop any sign of convection to the surface. But despite some trouble arriving a perfect analogy, subduction is a fact, which will become more clear when we examine the details. This is perhaps a slightly misleading diagram, because it might give the impression that the Earth is made of uniform, discrete layers which all end at precise depths. This is, of course, not the case, as any good field geologist can tell you. The continents descend to 600 km in some places, the ocean floors are of variable depth, and rock everywhere is mixed, variegated, and does not align in easily-defined concentric circles. Truth be told, there remains much debate on the correct labeling of the sub-surface rocks, and their exact nature. The image also seems to indicate, by its use of color-coding, that the only hard part of the Earth is a paper thin skin on the top, and everything below is molten magma. 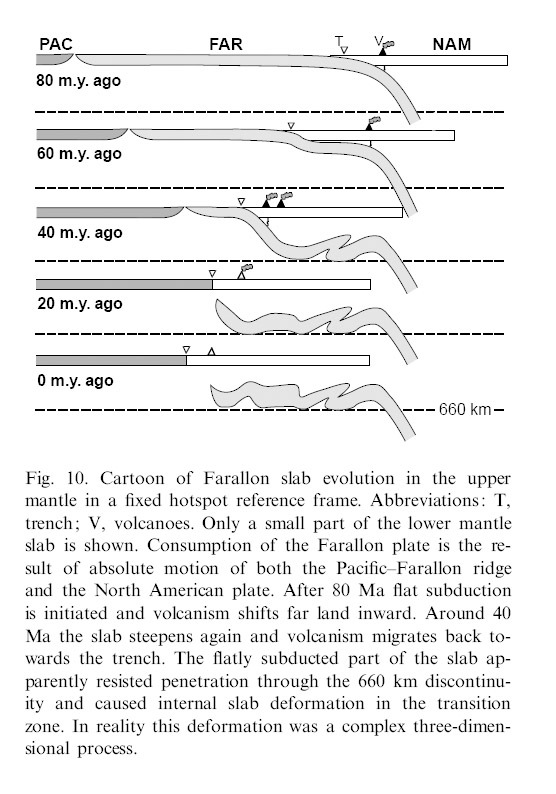 Of course, this is an understandable and forgivable simplification made by textbook manufacturers who need to demonstrate the undeniable facts of subduction quickly. If the Earth were the size of a soccer ball, the crust that we live on would be about the thickness of a piece of paper, or a sheet of plastic wrap stretched around the ball. The crust is the cold version of the material beneath it. That area beneath is called the mantle, which is thought to comprise seventy percent or more of the Earth’s volume. The continents and oceans tend to be made of rock that is less dense than what’s in the mantle. The continental rock is “lighter,” as rocks go, and so it sits on the surface. The ocean floors are lighter than the mantle, but slightly denser than the continental rocks. The lighter rocks on the surface sit on the denser rocks beneath, all the way to the core, which scientists believe is nickel and iron, and denser than any stone. – Diagram of subduction. Note – the diagram seems to represent layers of rock as flexible putty, which is not quite realistic, but is necessary to indicate the reality of subduction. Scientists say that the crust “floats” on the mantle. But they also say that it “dives beneath it” (which is the cause of subduction). If this sounds impossible, don’t worry – it’s a fact. Just remember that when they say “dives beneath it,” they’re referring to something that happens very slowly. Not fast, like a boat in water. But very, very slowly. In fact, it is probably impossible to express in human terms how slow a process this “diving” is, but rest assured, it is a fact, as is subduction, which occurs on Earth, but nowhere else. To recap: The phenomenon of the Earth’s crust diving (slowly) beneath the Earth’s crust into the solid densely compacted mantle is called “subduction.” And Earth is the only planet with subduction, which makes plate tectonics possible. Because subduction is a fact, it has been necessary to unravel its mysteries. First it was thought that the continents “wandered” around the globe. But other scientists have asked how continents could, in fact, wander. After all, they are embedded into the mantle to the depth of six-hundred kilometers. The answer came with the advent of the understanding of the fact of subduction. Continents seem to ‘wander’ because they are embedded into the surface layer of the mantle – the crust – which subducts. Naturally, when the crust moves, it slides (slowly!) over the compressed rock beneath it, like ice on a tray, or plastic in water. And that makes the continents, which are embedded in it, appear, over time, to float around and sail and wander. Here is a scientific experiment that demonstrates how the crust floats on the Earth and sinks into it. Notice that the putty sinks into the corn syrup. As you can see, subduction is a fact. Ridge Push, Mantle Plumes or Slab-Pull? Now that we’ve introduced the major concepts, we’re ready for the hard details of plate subduction. Subduction occurs when one plate – which is sliding and gliding (slowly!) across the hard compressed dense rock that makes up the Earth – meets another. This may seem a silly example, but there’s more science in it than you can imagine. Again, a note about image examples – we understand that the Earth is solid, densely packed rock, and not liquid magma, as is being depicted in these images from the documentary. But we also understand that a slight exaggeration is sometimes helpful in order to see the subduction process more easily. Now that we’ve seen it in action, let’s get to the nuts and bolts: How does it work, and what are the mechanisms? Spreading fissures encircle the globe. They are busy creating new earth and new land for the planet. Naturally, the first theory of subduction favored these zones as the driving mechanism: The plates (that is, the ocean floor) get pushed (or ‘nudged’) from the spreading ridges, and where the ocean floor meets a continent, or a less ‘water-soaked and cold’ bit of ocean slab, it drops (slowly! ), into the Earth. Let’s quickly address one small point that has caused some confusion: There are only about a third as many subduction zones as spreading ridges, which means that these zones must be ‘eating rock’ three times as fast as Earth is making rock. But that’s not really a problem, because although subduction is a fact, it is unknown if there is a rate of speed above which rock cannot be subducted. Again, the ridges “push” the ocean floor across where it drops “like a penny in honey” (but slowly!) into the zone where subduction is usually happening, because the ocean floor is near a continent, (or perhaps some other feature). How has “ridge-push” fared? Researchers have tended to walk away from this theory in favor of some other possibilities. It seems it’s probably not possible for the entire ocean floor to be ‘nudged’ left or right across its entire expanse, from a ridge 5,000 miles away. Subduction is happening, though, so let’s see what the other options are. – Subduction versus mantle plumes – it’s a battle of science! There are features on the planet that don’t easily match what we know would be created because of subduction, like certain island chains, ancient features like cratons, and new conceptualized zones called “Large Igneous Provinces” (which scientists call “LIPS”). And so in the early 1960s, some researchers decided that there must be very large and powerful volcanoes billowing hot material upward to the surface from deep down in the center of the Earth. They called these plumes, and the pro-plume camp believes that plumes explain a number of features that standard plate tectonics doesn’t. – Dr Gillian R Foulger (University of Durham, UK). From Dr Hetu Sheth (Department of Earth Sciences, Indian Institute of Technology (IIT) Bombay). Both quotes from “The Great Plumes Debate 2003,” presented online by The Geological Society of London. Strong words, indeed. But this should not provoke any doubt that tectonics still works, only that science is working to root out theories that work less well in explaining plate tectonics, which occurs on Earth, and nowhere else. As you can see, these expert sources agree that it is “subduction,” and not plumes or spreading ridges, that drives the tectonic engine of Earth, which makes subduction work, which is why we have plate tectonics. But How Does Slab Pull Do It? Slab-pull is one of the easiest concepts in all of plate tectonics. First, remember that the ocean floor, which is created at the splitting ridges, slides all the way across the hard compressed rock that it’s embedded in, like a disco roller-skater on a dance-floor (but slowly! ), and then meets another “plate.” When it touches another plate, it has a choice to make: Will it dive, or will it over-ride the opposing plate? The answer: Age before beauty. That is, the older plate usually is the one that leaps downward (slowly! ), and is over-ridden. Because it’s older, and has been in the ocean longer, it has been exposed to more water. This “water-soaked” rock doesn’t have any choice but to sink down into the solid rock mantle, because it is now so very cold and wet. The area beneath the ocean floor is “dry and hot.” But the ocean floor is cold and wet – “water-soaked.” And because it is colder and wetter, it penetrates the Earth’s “dry and hot” layers. – Slab-pull in action (instructional diagram) Note the Mantle is “weak” and “viscous” in this image. Even though the mantle is highly-compressed molecularly-altered rock at depth, it helps students in explaining the truth of subduction tectonics to label it as is done here. Of course, this is a slight inversion of the usual running order on Earth, where the surface rock is less dense than the rock beneath it. But, after a great deal of exposure to water and cold, that rock eventually becomes so cold and dense that it breaks through (slowly!) the layer of rock that it used to be much less dense than. If you have ever been cold after swimming, you can see that this is a fairly simple equation – time, plus rock, plus water, equals subduction. All that remains to drive the cycle forward is that the crustal layer touches any other piece of rock that’s older than it is. Or, any piece of rock that is less dense than it is. Or warmer. In either case, it will dive straight down (slowly!) into the deeper solid rock mantle. What scientists have discovered, as Dr. Uyeda said, is that this descending “cold slab” as it’s called, “plays a more fundamental role than seafloor spreading” than even “ridge-push.” That is, it is not the “push” from the ridge that causes the sea-floor to expand. It is the “pull” of the cold slab descending (slowly!) into the Earth, and pulling the rest of the ocean floor along with it. And that is how today’s best geophysicists have determined that subduction works. Good question. The answer is simple. If the ocean floor were to sink wherever it is old and cold enough to do so, then the entire ocean floor, after a given time span (for example, 40 or 50 million years), would all begin to sink into the center of the Earth, which would mean that Earth would be uninhabitable and not be able to support complex life. But the Earth has not been destroyed by subduction; therefore, we can correctly assume that subduction only occurs when a slab meets another slab. To review, the slab, because it gets cold and touches another slab, sinks into the solid mantle (slowly!). At some point in its descent, however, it becomes very hot, because it comes under pressure. This is the precise mechanism which allows it to sink even further. Take note – if the slab were not heated, it would cease to sink. It is now believed that because of this lack of further heating, some slabs do not sink more than a few kilometers. And researchers have recently decided that some plates only achieve something called “flat subduction,” in which the plates begin to subduct, but then appear to stop doing so, and instead simply “ride under” the surface, penetrating the solid crust (slowly!) in a more or less straight line, parallel to the surface. But if they don’t descend, how can they “pull” the ocean along as we know happens because subduction is a fact? This will certainly provide an interesting challenge to researchers for years to come. – The confounding “flat-subduction” process explained, in theory. More funding will certainly be required to problem solve this one. It is sometimes difficult to give entirely accurate descriptions of what is happening beneath the Earth’s surface, because, in reality, no one can see what is happening there. The deepest hole ever drilled reached about nine miles (15 km) beneath the surface, but it is approximately 3,950 miles (6,370 km) to the center of the Earth. So calculations of the material of the planet are based on surface materials and sound-wave measurements, interpreted according to prevailing models. But as subduction drives plate tectonics, most data can be correctly understood, and are unlikely to be misinterpreted. Now let’s wrap up the slab-pull process – first, the coldness of the slab causes the slab to sink, which causes the slab to become hot, which causes the slab to sink further, unless it does not do so. This “pulling” causes the ocean floor to expand. And that’s how it works. You can review this in any technical drawing of subduction and find that it is a true description of the process of subduction, which is happening here on Earth, and nowhere else. – Instructional image of plate subduction, and cold/hot slab pull. The slab descends, pulling the ocean floor along, because it is cold, and then because it is hot. You can count about 14 major plates, which clearly demark the continents and other zones, for the most part. One issue that has troubled tectonic researchers is the apparent flexibility of plate boundaries. It seems some, or many, shift, or are difficult to define. Some are considered to be “fuzzy,” and not clearly delineated. Some seem to be less true “boundaries” and are more like “zones” or “areas” which can stretch hundreds, or even a thousand miles. And some plates overlap other plates in unexpected ways, but that’s probably due to convective forces or perhaps mantle plumes. Where Do the Plates Move? But there have been some adjustments to this model. Geophysicists have discovered that a plate will be dotted or intruded or surrounded by many other smaller plates, which will often be turning in a slightly, or entirely different direction than the primary plate. These are interesting exceptions, which demand further study and funding. In fact, one could say that the exceptions are proving the rule – at present there are over a hundred identified “micro-plates.” More funding will certainly be needed to help explain how these dozens and dozens of micro-plates fit into the subduction/convection/ridge-push/ridge-pull/mantle-plume cycle. Yes, one can see the field of research here is fertile, and will indeed require more funding for years to come. How Did Plate Tectonics Begin? We know that Earth is the only planet which has moving tectonic plates, because it is the only planet with subduction. But how did subduction begin? Researchers have already determined that the moon was probably formed when a “Mars-sized” rogue object impacted the Earth, so it’s a strong possibility that this is the case for tectonics, too. Some may object to this as a deus-ex-machina or “rogue planet” defense, but it is well known that dismissing asteroid impact or near-impact is usually the mark of pseudoscience. Now that we have reviewed and understood everything there is to understand about the Earth, I think we can finally form a clear picture of it, according to factual, verified, peer-reviewed science. We’ve gone from soup to nuts, and learned a great deal along the way. We have learned that subduction is a fact and drives plate tectonics, which occur nowhere but here on Earth. We have learned the difference between pseudo-scientific theories like “electrified plasma” shaping galaxies, and “rogue planets” acting as comets, versus the true science of the “big bang” and the nebular hypothesis and the moon and plate tectonics commencing when rogue planets impacted the ancient Earth. And, I hope we have learned that science and learning are fun – especially when you remember that you’re here to learn, and ask appropriate questions of your betters, and not to try to upend their apple carts. Who knows, someday your career might depend on a pack of lies that someone told YOU. How would you feel if some young upstart came along and demanded real answers? You’d be pissed, is what. So, in praise of science, let’s go take a walk along the flat, subducting Earth, inject ourselves with untested vaccines that governments want us to take for the pandemics they invent, and remember, always believe what you see on television – and especially PBS science programs. Because they tell the truth, the whole truth, and nothing but the scientific truth. That’s tax-payer funded science – the truest science that there ever was. Great Article! The High Priests of the Church of The Grand Uniformitarian Confabulation are gonna love it! It all goes to show that a complicesque, cross-webulated, process of mutual-inter-assumptive confabulation can be a powerful tool of government funded science. And with sufficient funding by taxpayer dollars, it can produce a world view that we can all learn to accept, and live with. That is, as long as the appropriate financial sanctions, and literary safeguards, are in kept place to keep out unwanted questions from the lunatic fringe that cause the highly expensive, virtual data to become contaminated by the occasional empirical fact. Not believing any of this, I must count myself among the pseudo-scientific rabble. I do come across some interesting pseudo scientific nonsense from time to time, and as it’s interesting to me, I post it on my blog. Of course we know bloggers are nowhere near as trustworthy as the mainstream press which repeats the cutting edge nonsense promulgated by the best scientists. Yet, perhaps someone is interested in how planets and start are formed by rotation (yes, plain old rotation of a nucleus that attracts all kinds of loose stuff from space) and how, due to the rotation, (which we do observe in almost all planets and stars and even in simple particles of sub-atomic matter) the form of those bodies turns out to resemble a hollow soccer ball or perhaps rather a pumpkin which has a shell a bit thicker than the ball. I know that’s of course totally non-scientific, coming as it does from people who don’t possess the blessing of government funded insights. Continuing to accumulate matter from space, that rotating pumpkin must of course grow and the continents consequently must spread further and further apart. Volcanic activity is the product of a surprisingly active and chemically maintained heat source able to melt rocks … oops – those melted rocks have always been there – they are supposed to come from hundreds if not thousands of miles down, from the hot interior of the planet. How did it get hot again? Yes, it’s the pressure. Yet, I was fascinated to read an account on how the earth’s crust or carapace is apparently subdivided into different zones, an inner one where hydrogen prevails as the abundant element, and an external one where the main element is oxygen. At the interface between those two gases, all kinds of havoc happens. Hydrogen and oxygen react violently releasing a lot of heat, and so we have volcanic activity. But then … that is of course heresy. It also isn’t funded by the maintainers of scientific purity. Someone figured that out all by himself. Couldn’t be true now, could it? Contrarians! I see you! That damned internet again! Spreading theories. Quiet you at the back! McCanney is worth mentioning too. But don’t do it on the thunderbolts forum as it will result in banishment! Even contrarians have their limits! Good grief! What a pile of doo-doo. What I don’t get is the aversion to the simpler hypothesis, which can be explained so simply – the expanding earth. It doesn’t mean that mass is being created, it just means that as the earth’s core is cooling that the matter underneath is becoming less dense (compare granite with pumice in density), so the extra material has to GO somewhere (expansion of the ocean floor and other places, like San Francisco), making the surface larger. What’s so difficult about this??? I guess a simpler theory wouldn’t require multiple Ph.D.’s to understand it. But maybe it would provide a model where we could actually predict earthquakes before they happened. And a raft of “scientists” whose entire careers would be exposed as junk. Thanks for reading along! A lot of info, most of it contradictory to itself being paid for by tax donations to the tin-cup rattlers in gov’t science. Mass is not matter. Everyone gets flustered over the idea of creation of ‘matter’ from nothing (except for the creation of everything from nothing (bang!) a long, long time ago). But mass is a property of matter, which I think can be increased or decreased. Mass relates to energy. Increase the energy in an atom, by, let’s say, speeding it around a track, as they do in the pointless-and-expensive ‘colliders’*, and the researchers find an increase in MASS of the matter they’re spinning. Mass increases with energy increase. Matter stays the same. And in any case, we’re all bombarded with matter all the time, and so are all planets. Streams and rivers of very-low-mass, very-low-energy subatomic particles, neutrinos, ‘subtrons’ perhaps. What a really good romping read!! There’s not too many real scientists would pick you up on too many points there, and hope to trip you up. Especially the bit at the bottom – what tax-payer funded science is *really* about. I’ll bet you were a real blast in class. How many times did Teach have you out on your ear? …or do the, “See me after class” routine? One little sober thought amongst it all was some feeling for the cleanslates who joined up thinking geology was going to be great fun and paid for it, only to get clobbered with multiple choice, ‘tick-the-box or else’. Or is that part of the joke too? I’m not sure which is the bigger, .. yours, ..or theirs..
All funny. a real roller coaster. Don’t know why Sepp there says he doesn’t believe a word, ..it’s all true. Just nobody fall off and we’ll come out the other end. Hey, you forgot to add the only reason Earth is the only planet with Plate Tectonics is because we’re here. (In the image of God and all that). I am thanked of you, for sharing such kind of information being student of Science I have gotten lot information on this website. I’d request You should keep up date more knowledge, it enhance our knowledge. Liam Scheff … would you care to back up your ignorance in a debate? …. Kristian Birkeland ( a pseudo-scientist?) Irving Langmuir ( a pseudoscientist? )Ralph Juergans ( a pseudo scientist?) Hannes Alfven, David Bohm, Faraday, Mazwell, Anthony Peratt, Weber, Ampere, Gauss … all pseudo-scientists???? Earth itself is a single giant living organism. Plate Tectonics is textbook pseudoscience. Observe that the oceans are growing, conclude that the Earth can’t grow, and invent “subduction” to “prove” that the Earth isn’t growing. Then look for “subduction”, and call anything remotely unusual “subduction”. According to PT, Africa is being pushed East by the Atlantic, West by the Indian Ocean, North by the Southern Ocean, and South by the Arctic Ocean (through Europe). Growing Earth recognizes that the path of least resistance is straight UP through the less dense air, not down through more dense mantle, or any compass point through equally dense rock.